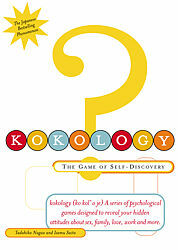 KOKOLOGY comes in two words— KOKORO and LOGY. The Japanese term KOKORO means a soul or spirit and LOGY- a greek word for study. It simply means a study of Soul or spirit. The book of KOKOLOGY has many many questions that usually tackles about how the person behaves in a given situation that a normal person might encounter. Each choices has its own corresponding behavior that usually reveal our own personality. Buy a kokology 2 book for a better understanding of your own self. It will be so much fun if you’ll let your other friends join you while reading this book. You can get one now on Amazon and ship to your home! Goodluck and wish you all the happiness while discovering the true YOU!! Try it, I greatly recommand you do it!